I LOVE fuzzy little bunnies but…. …. we’ve been lulled into a rabbit takeover. During our severe 2014-15 winter, we watched from the window as one sad rabbit fought to survive atop 3′ of snow. We were pulling for the bunny as it nibbled birdseed and whatever else it could find. At neighborhood gatherings, we exchanged sightings and worried about our bunny. He/she survived. That was then and this is now. Perhaps we were seeing more than one or it found another survivor. There had to be a male and female because we now are seeing the breeding potential of rabbits. Yards this summer look a little like the invasion of jackrabbits out west. At times, all I see from the window are baby bunnies… very tame babies, baby bunnies that graze from yard to yard, from garden to garden. I’m playing catch-up learning about their diets. What do they like and what do they not like to eat? They hop around the yard nibbling grass and that’s perfectly fine but when I discover nibbles from my garden, I worry. They don’t seem to totally eat anything…. except all my sunflowers and liriope. They sample from the smorgasbord. They seem bent on destroying plants, not eating them. I don’t want to harm the rabbits but trying to learn how to protect my garden. Coyotes, foxes and hawks are natural predator that may balance out the number but right now I need solutions. Suggestion so far: red pepper spray (seems cruel), a dog or cat (too disgusting to visualize), barber shop hair, motion detector sprinklers, scare tape or balloons, pinwheels, but the only solution I see for me are plant cages. Drat. Wonder if there is a sure-fire solution other than harming these cute little cottontails…. Life is for celebrating and all the employees at Rolling Green Nursery did just that when the owner had a milestone birthday a few days ago. 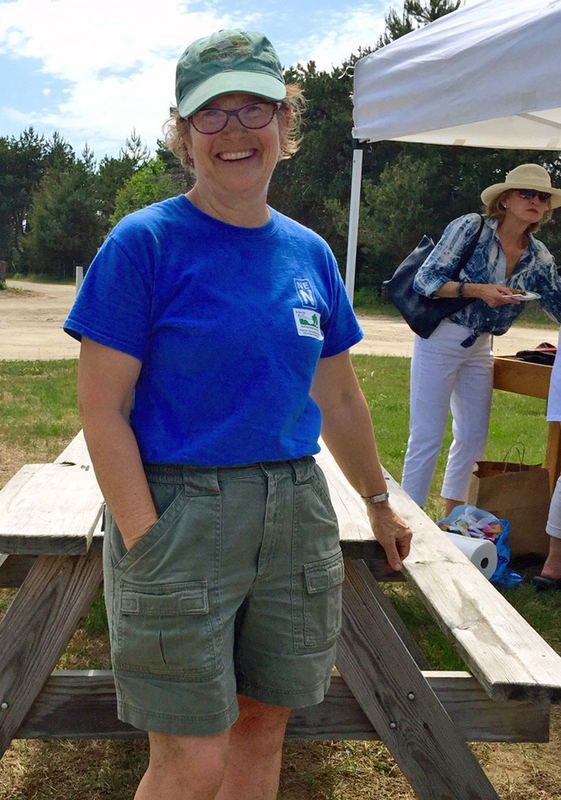 Major kudos to Rick Simpson who pulled off a first-rate surprise for his wife, Beth. And I was lucky enough to be on duty that afternoon when the call came in over employee’s radios. Come to a party on the far side of the property! Not only were two delicious cakes being cut for party-goers, Rick had another surprise for Beth and all of us. 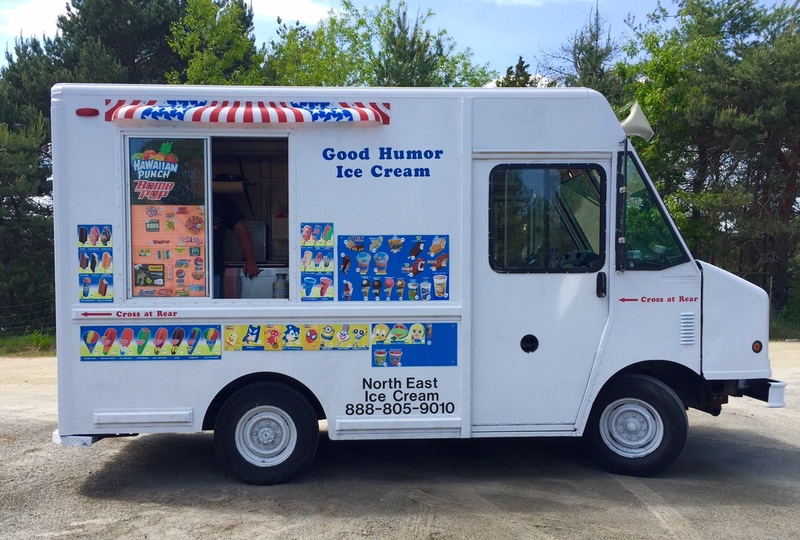 And there it was….the Good Humor Ice Cream truck complete with the jingle-jangle music from days of yore. There were bomb pops, creamsicles, drumsticks, ice cream sandwiches, fudgesicles, Snickers ice cream, klondikes, snowcones. 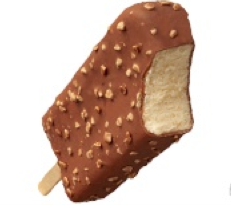 And there I was….transformed into an 8-year-old sitting on the front stoop licking the drips from an ice cream bar after chasing down the ice cream truck, quarter in hand. The National Weather Service has announced that New Hampshire is experiencing a moderate drought. We’ve had scant rainfall this spring. You might ask: Where’d all that record-setting snow melt go? I wondered, too. The answer is two-fold: Our snow was ‘fluffy and dry’ according to Alan Dunham, a meteorologist with the National Weather Service in Taunton, Massachusetts and the water content of our snow was low. Secondly, according to Michael Rawlins, an assistant professor of geosciences and a hydrology specialist at the University of Massachusetts in Amherst, the small amount of water in the soil has evaporated. The upper surfaces of soil were saturated but with little precipitation, it’s gone. 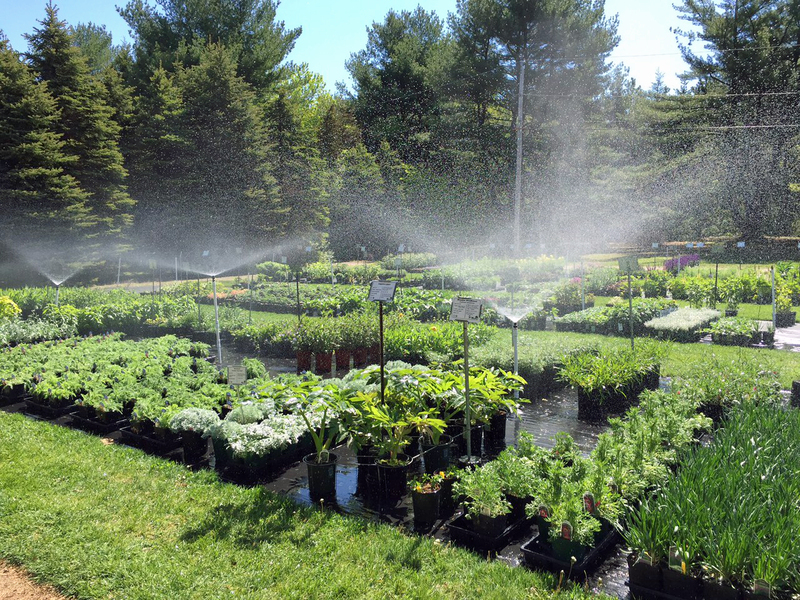 It’s been hot and dry at my work place, Rolling Green Nursery, but just seven minutes of overhead watering first thing in the morning on the hottest days give perennials enough moisture until we can get a hose to them all. The National Weather Service tells us that summer will bring extended dry conditions to southern portions of New Hampshire. Voluntary water restrictions are already being put into effect. Thankfully, we aren’t experiencing the dire conditions that western states are enduring but we’re having a small taste of it and the National Weather Service is predicting a dry summer for us in southern New Hampshire. Mild droughts are more common here than many realize and data tells us that droughts are expected to become more frequent as our climate changes. However, our collective wish was answered yesterday when the heavens finally opened for a good part of the day. Today we have a soaking rain and tomorrow should bring the same. We will need a lot more though! I took a walk around my own landscape this morning and saw some happy plants just soaking it in. There is nothing quite so beautiful as a life-sustaining rain. Hover over photo to ID plants or click to enlarge.